These are excerpts from the notes of Mr. C.G.H. 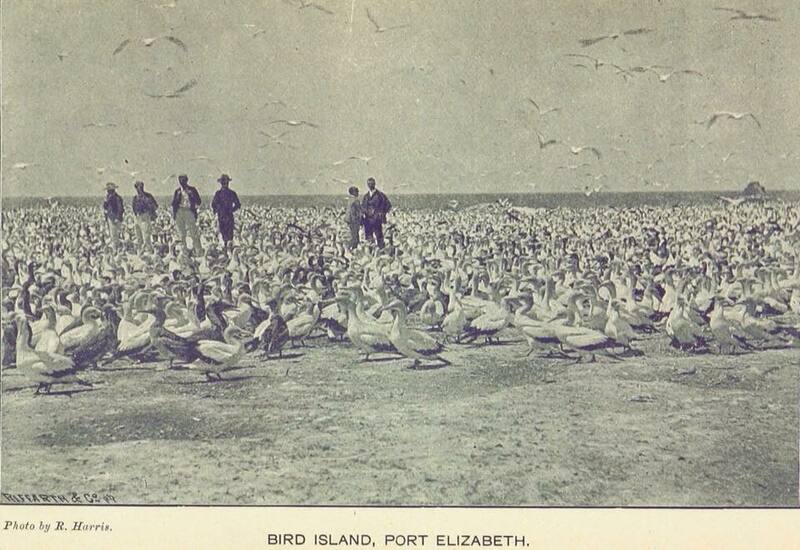 Skead on the early days in Port Elizabeth written in 1939. They provide a personal view of the various activities at the harbour and the development of shipping at that time. These recollections take one back to a bygone era when life was simpler. Imagine still being able to swim on a splendid beach at the foot of Fleming Street. Born in 1871, my first clear recollection of the harbour of Algoa Bay was when my father, Captain F. Stead, took my brother Cuthbert and myself onto the breakwater from whence we watched the porpoises playing. 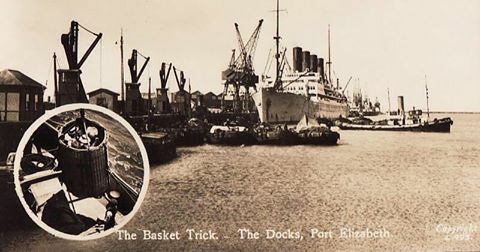 At that time, all the sea traffic was brought by sailing vessel and the only jetty was a small one built at the foot of Fleming Street. We boys used it for leaving our clothes on while we bathed on a splendid sandy beach running south to the Baaken’s River. There were very good swimmers, notably Rowbotham and Gronan [who was afterwards killed by a lion (while) in his hut at Umtali] who would, in fine weather, swim right out and be away [for] an hour or two. Danger from sharks was never thought of until many years later when Mr. Rodwell, bathing at the end of South Jetty, had a leg taken off by a shark, which had been attracted by the throwing of fish offal from the end of the pier. 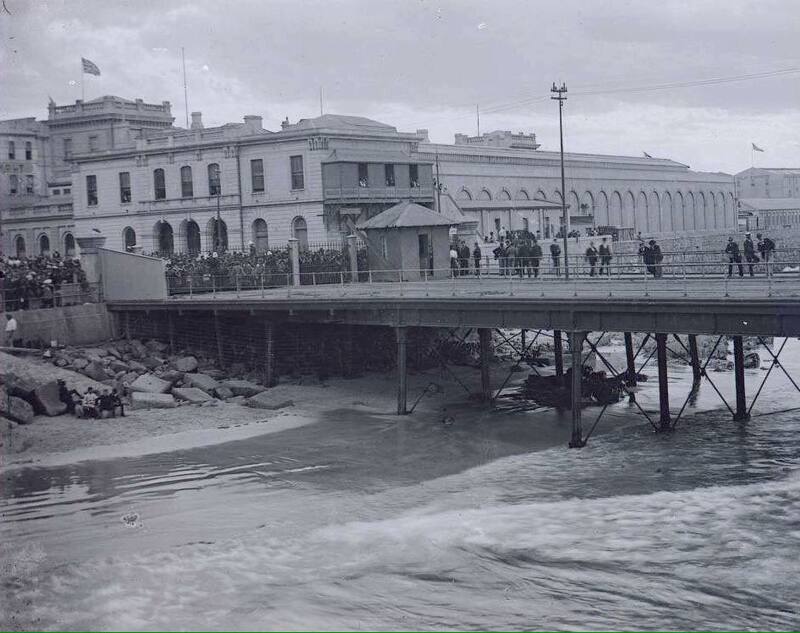 The first really useful jetty was commenced in the 70s at the foot of Jetty Street, and ran out beyond the breakers only, until extended in later years. A sea wall [presumably Victoria Quay] built to protect the railway [line] ran northwards [for] about a mile. Then built as far as Uitenhage, the goods had to be carried on to Grahamstown. 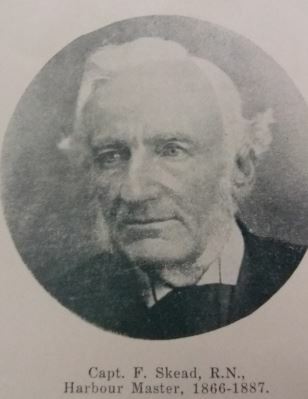 Cobb’s coach, carrying passengers, ran between Port Elizabeth and Grahamstown. Southwards from the breakwater at the mouth of the Baaken’s River, ran an unbroken sandy beach, except at low tide when a low flat rock was exposed. The breakwater had banked up a short sandy beach on which several bathing machines were placed. Further on, lay the wreck of the old slaving vessel, the Don Pedro, just where the jetty of that name now stands. 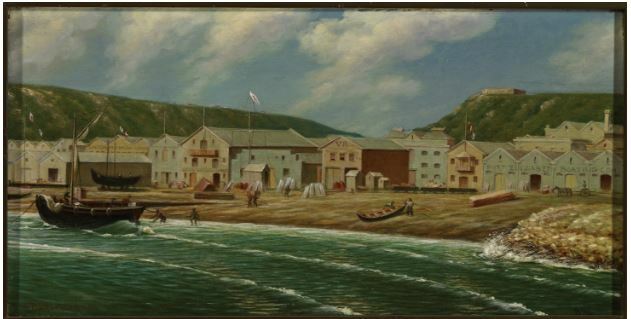 The original line of the beach had been the foot of South Beach Terrace, but the Harbour works had pushed the shore back seawards. All the cargo to and from the port was carried by sailing vessels, taking about 90 days for the voyage from England. It was a fine sight to watch these ships enter and leave the harbour under sail. A fully rigged ship in a brisk breeze was an unforgettable picture, and the departure of the man-of-war Raleigh under full sail was talked of for many years after. When there was a seasonal rush of shipping, there were times when the port equipment could not cope with the rush, and sometimes 20 and up to 40 vessels were riding at anchor at one time, a fine temptation for south-easter gales. 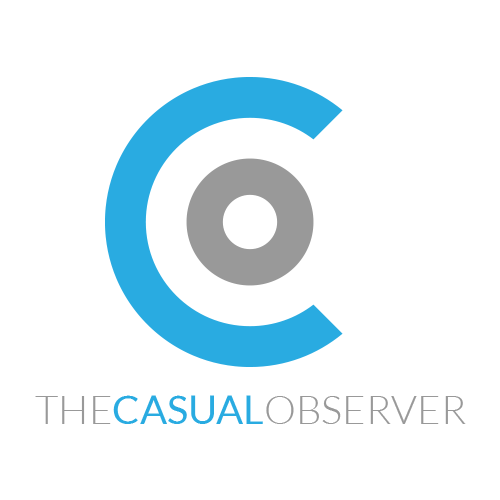 The blog below was also compiled from the notes of Skead and complements this blog. Stevedoring was mostly done by contractors owning sailing boats to take workers to and from the ships. Names of these that occur were Chiazzain, Olivier (Frenchy), the Messinas, Schello and Gini. The work was no child’s play, even in fine weather, but was very hazardous in rough weather with a heavy sea running, a strong tide, ships rolling and lighters pitching and tossing alongside like corks. 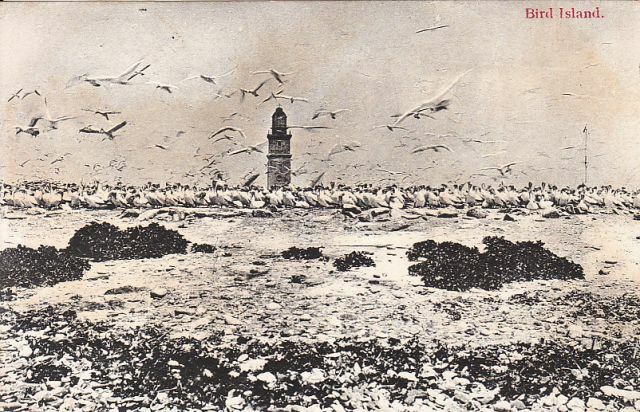 Once a month, one of the sailing boats (usually Chiazzain’s) was chartered to take stores to the lightkeepers at Bird Island and my father went too (in order) to inspect the lighthouse. They were often away (for) two or three days, and several times great anxiety was caused when the boat was away for a week because the landing stage at the island had been unapproachable in bad weather. 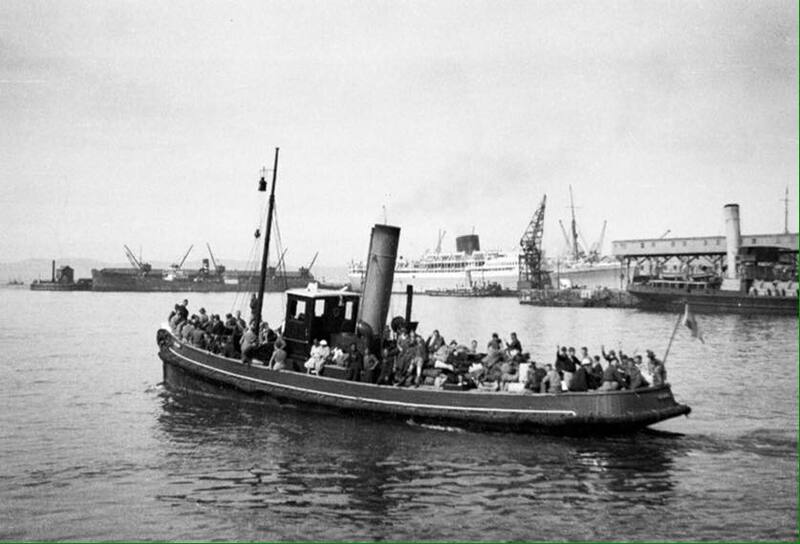 Later, when the first steam tug, the Koodoo, carried on this service, we boys often accompanied my father on these trips. Once a pleasure trip to the island aboard the coaster Melrose was organised. Many ladies and men went on the voyage, but there were many lame ducks on board before she returned. More and more tugs followed the Koodoo, among them were the John Paterson, the James Searle, the Sir Frederick, H.B. Christian, Sir William MacIntosh, John Dock and the C.F. Kayser. Also many privately owned passenger launches were run as trade began to develop: Ulundi, Germania, Colonist, Countess of Carnarvon which was sunk in the river near Lourenco Marques when gunrunning during the Boer War, Albert, Garth et cetera. The landing work was gradually taken over from private contract by various boating companies. Several of these failed when times were bad, and eventually only two were left, the Union under James Searle, and the Port Elizabeth under James Forbes. 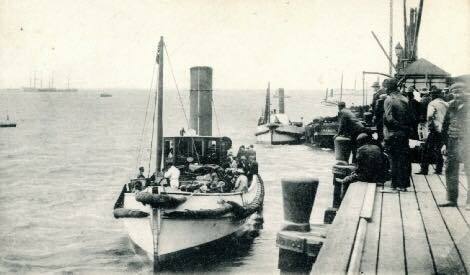 These two then amalgamated and operated as the Associated Boating Company until the government took over. The work was very efficiently and economically carried out by the companies, but vested interests were being created and had to be done away with. The Arab, Athenian, Nubian, Briton, Roman, Saxon, Norman, Dane, Tartar, Spartan, Moor and the Scot, a lovely yacht built vessel, which held the record between Southampton and the Cape until a few years back. With later development came the intermediate steamers, followed by the Clan, Bucknall, German and other lines. Tintagel, Dover [struck Roman Rock], Berwick, Donne [lost afterwards on a Cocos Island treasure hunt, Duart, Raglan, Dunluce, Durham, Dunbar, Dromsee, Gloucester, Garth, Llanstephen, Llandover [torpedoed despite being a hospital ship during the Great War, Llandaff and Llangibby. 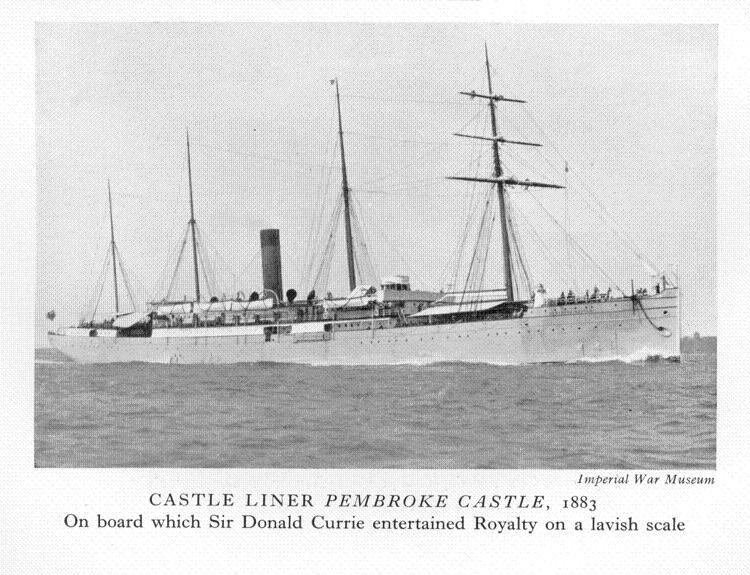 The advance in the steamer tonnage can be gauged by the advertisement of the new mail steamer, Pembroke Castle, of some 3,000 tons burthen with “all the latest improvements”. [There were no electric lights yet and I can still see those candle lamps in the cabins, swinging ceaselessly in gimbals, to and fro, up and down, while one lay in a bunk deadly sick, watching them, quite fascinated while the smell of grease and oil was everywhere. Some changes were made to grammar, spelling or to improve the flow but in essence, it is faithful to the points made by Mr Skead. Examples include amending the name of the jetty from Dom Pedro to Don Pedro.